We are Real estate agents and property dealers in Indirapuram. We have solutions for normal to premium apartments in Indirapuram. We are associated as channel partners with reputed builders we our committed to provide transparent and quality services for the property needs of consumers. Indirapuram is one of the fast developing area in Delhi NCR located in Ghaziabad and close to delhi border. Indirapuram is a modern township touching the delhi border and closest to Noida. The infrastructure hers is well developed and this area has become a home to high rise residential buildings. 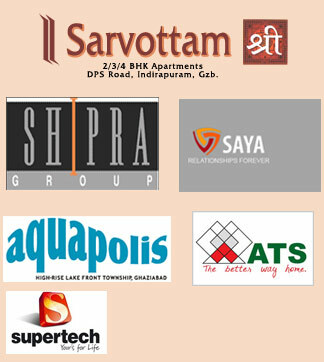 Some of the highly reputed builders like Guar, Supertech and Amrapali had launched their initial successful projects in Indirapuram only. Indirapuram can also be called as one of the posh areas of ghaziabad and its closeness to delhi noida, noida extension and main ghaziabad makes it even more special. There are more than eleven shopping malls alone in Indirapuram. Shipra mall being one of the oldest and best shopping malls of delhi ncr. Finding the right property for you is easy once you leave it to us. We will get you the best properties in best locations and the best deals. We are committed to serve our customers with full transparency and trust.